The long-awaited 2013 revision to the standard reference text for Scouting’s advancement programs has been released, leaving a somewhat bewildering series of changes and clarifications in its wake. 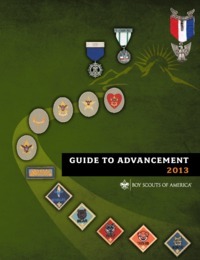 The 2011 document did a great job of consolidating, codifying and clarifying BSA’s rules relating to advancement. The process of creating the work was a careful one involving professionals and volunteers from all regions. The language was carefully chosen to clearly state the various rules, policies and procedures. It became the go-to answer book on all things advancement. The most significant change relates to just what is expected with the learning and teaching of Scout skills. Previously, a Scout was expected to have some degree of mastery of a particular skill in order to receive credit. Rather than reflecting what a boy is able to do, a requirement satisfied indicates that the Scout has experienced learning something new and has gained the confidence that he’ll be able to learn more. Receiving a rank badge no longer necessarily reflects what the boy is able to do; rather, it indicates personal growth toward a goal, and that he has attempted learning new skills, whether he’s actually mastered them or not. There is the additional assumption that a boy isn’t necessarily expected to put his skills to use until after he’s been recognized for them, by means of a check-off on an advancement item. This change puts the method of advancement into perspective; it’s a recognition that the process of learning and teaching of skills and recognition for having done so is more important than the actual practice of the skills. Through the process, growth occurs and the values of Scouting are instilled. Summer camp staff is now allowed to sign off on Tenderfoot through First Class requirements. Previously, a Scout would learn the skills, usually in a first-year camper class setting, but would then have to demonstrate those skills to the satisfaction of his troop in order to receive credit. Now, summer camp staff are permitted to sign off requirements, though they are told they should give the unit the opportunity to do so as well. Several ongoing complaints from the unit perspective about the merit badge system are answered and resolved. Most significantly, there is now a procedure for challenging the quality of merit badge counseling. Previously, once a counselor signed a blue card as complete, nothing could reverse that action even if it was demonstrably true that the boy did not actually meet the requirements. (An example would be if a Scout did not have sufficient nights of camping for the Camping merit badge, but received a completion anyway.) Now, a Scoutmaster can refuse to accept a signed blue card if he knows the Scout could not have completed the requirements. There’s a new form for reporting substandard merit badge instruction, which allows unit leaders to specify problems including failure to follow the requirements, non-attendance or participation by a Scout who received credit anyway, and merit badge counselors not being registered. Councils can now officially place limits on the number of merit badges an individual can counsel, and units can limit the number of badges a Scout may earn from the same counselor. These requirements are meant to put an end to “Mom” or “Dad” signing up as a counselor for a large number of merit badges and counseling their own son in them. Merit badge counselors must agree to see evidence that work done outside the counseling session has actually been done before approving it. A Scout telling a counselor he cared for a reptile for thirty days must be corroborated by photos, daily logs, statements from a parent, etc., or actual evidence, such as bringing in a stamp collection, rather than telling about it. It’s reinforced that while group instruction of merit badges is permitted, there should be a compelling reason to counsel as a group, rather than individually. A section is added covering what’s commonly known as “double dipping,” or using one action to satisfy two or more different requirements. The new language clarifies that if the requirements exactly parallel each other (such as nights of camping for rank as well as for the Camping merit badge), performance of those actions may be used to satisfy both requirements. However, if there are differences, each must be done separately and specifically toward the wording of the requirement. The example given is the requirement to attend a public meeting, which exists in both the Communication and Citizenship in the Community merit badge requirements. While attendance at the same meeting may be used for both, the follow-up action after the meeting differs and must be done specifically for each merit badge. Outside organizations may present merit badge clinics and classes, but must obtain approval from the local council in order to do so, and cannot trade on the name of the Boy Scouts of America. Neither outside organizations nor Scouting units may charge fees for merit badge clinics or fairs over and above the actual cost of running the instructional program. Boards of review are now allowed to exclude observers, including the Scoutmaster, if they feel their presence would inhibit open and forthright discussion with the Scout. Parents are still strongly advised to stay out of their own son’s board of review and are to be cautioned that their observation could change the dynamic of the review, but must be allowed to observe (but not participate in the discussion) if they insist on being allowed to do so. Troops are advised to hold boards of review “promptly,” rather than monthly as previously stated. In emphasizing that the board of review is not a re-test, “mock” or practice boards of review that some troops hold are officially discouraged. While previously stated, it’s clarified that a Scout seeking two rank advancements on the same day may do so, but each board of review must be separate, each preferably composed of different members. There are several other differences, including some changes to the Eagle process, which I’ll cover in next week’s article. The new rules state ” Scouting units may charge fees for merit badge clinics or fairs over and above the actual cost of running the instructional program.” Many troop host merit badge academies once a year as fund raisers and charge a modest 10 to 20 a day for up to 2 merit badge classes. Does this rule eliminate this fund raiser opertunit? councils may exercise their authority not to approve them. So it appears that merit badge fairs and such events are intended to be offered in the spirit of service to others and not run as a way to make money off the program of the BSA, even if it’s a unit making the money.